06/06 photos taken in Wisconsin. 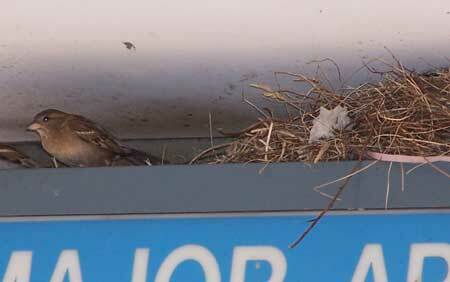 As you can see, HOSP will nest in very close proximity to each other. 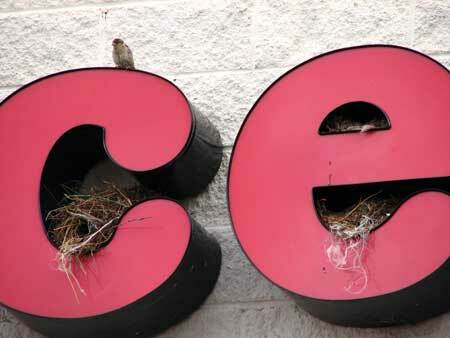 Notice the tunnel shaped entrance on the nest in the bottom of the "C". Plexiglas over the holes might prevent this, but it would be difficult to "invisibly" exclude them on the open ended letters. Stringing wires over the openings (spaced 1" apart?) might help. 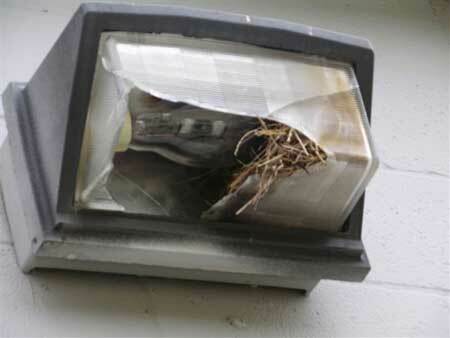 Otherwise regular removal of nests is needed (e.g. using a scissor-lift or hose). Signs that are flat against buildings would also work. 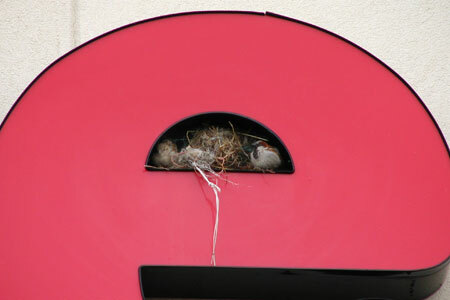 Six pairs of HOSP were nesting in this sign on the front of this building. When there is plenty of food and nesting and roosting locations, densities can reach 3,108 to 3,367 HOSP per square mile. 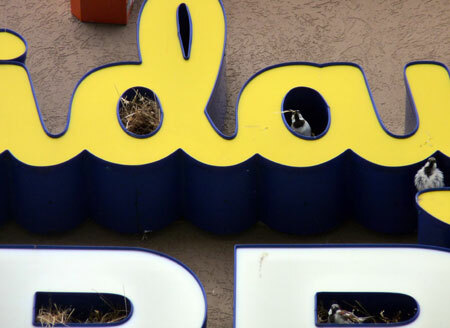 The problem with businesses "learning" to remove HOSP nests is that some then think it's okay to remove nests of native birds like cliff swallows. Disturbing the nest of a native bird without a permit is against the law. 07/09 photo in Austin, TX, with HOSP nesting in the letters d, P, R and E and using other letters as perches. 04/23/06 photo in San Antonio, TX of a car rental facility. Two nests were within 8 feet of each other. HOSP were defecating on cars below. Bird feces are acidic. Plastic bird netting might not be terribly attractive, but it would prevent this. So would a different design without ledges. 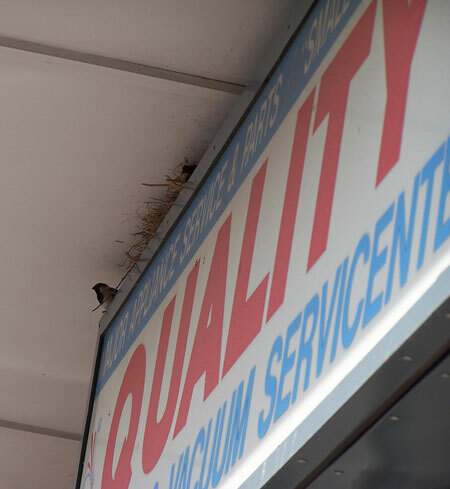 This HOSP nest (female on left) is jammed in a small space between a sign and the roof of a strip mall overhang in Vernon, CT. Extending to sign to the ceiling would eliminate nesting opportunities. In the same strip mall in Vernon, CT a HOSP nests above a different sign. 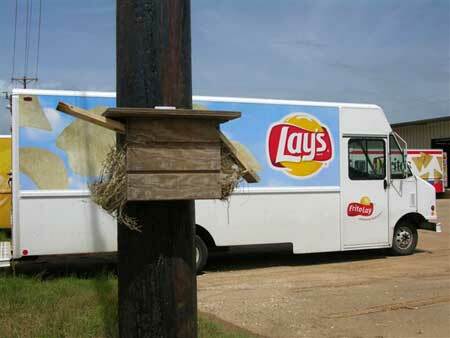 At this warehouse, they feed broken bags of chips to the birds. This experimental double nestbox has HOSP nesting in both ends. Photo by Keith Kridler. 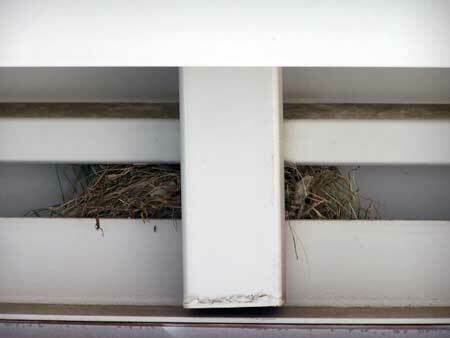 House Sparrows nesting in a broken light fixture. Photo by Keith Kridler. Right beside this light, a nest is being built on top of the switching levers for the power cut off for a strip mall, right out in the open on top of a large transformer. HOSP are nesting in the rafters of this brand new corrugated metal building, and defacing the building and brickwork with unsanitary droppings. The owner filled the spaces they are using with "Great Stuff" expanding foam. 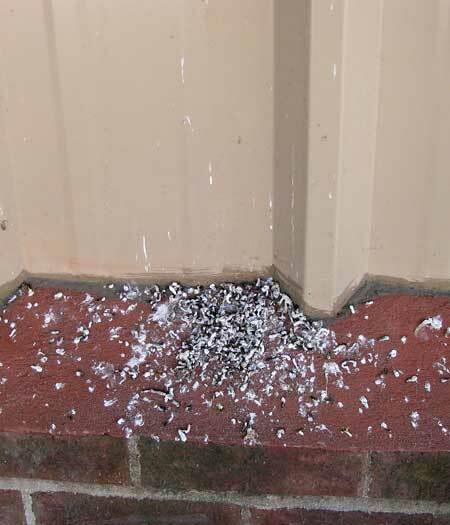 Persistent house sparrows will peck through the hardened foam, but it will deter them for a while. Hardware cloth (flexible mesh that you can buy at a hardware store) will keep them out, and some areas can be stuffed wtih crumped up screening material or steel wool. 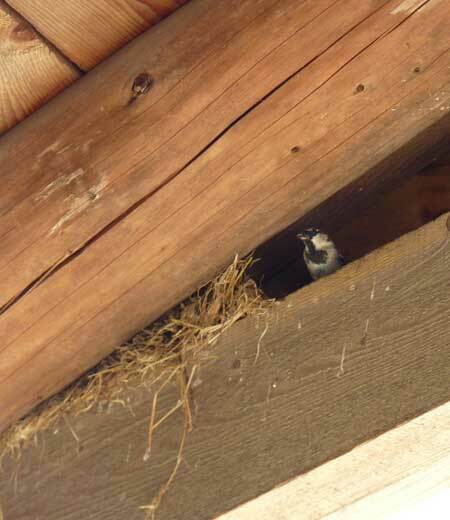 Rafters provide good nesting and perching spots for HOSP. This one happens to be in an open area, allowing easy access. The crevice should be filled with "Great Stuff" expanding foam to eliminate the nesting option. 04/27/06 photo in San Antonio, TX at a large hotel. Notice the tail of a female HOSP as she flew into the crevice to feed young. 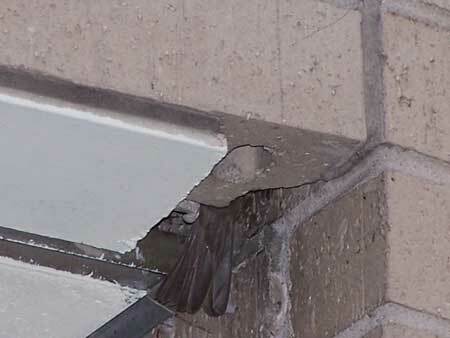 Wire mesh, or filling this crack with "Great Stuff" expanding foam (sprayed on wadded chicken wire placed in the hole) would prevent nesting in this instance. The foam can be trimmed and painted after it hardens. The English Sparrow, with its grown and growing progeny, is a conspicuous nuisance. Can there be no way devised to abate him, if not totally, at least partially?